We’d love your help. 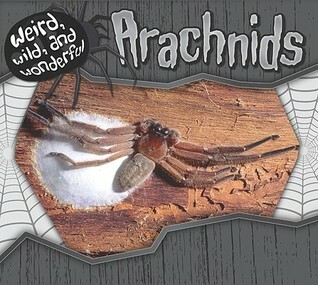 Let us know what’s wrong with this preview of Arachnids by Julie Murphy. To ask other readers questions about Arachnids, please sign up. "This series is well organized. Each book, except Frogs, contains a “fact file” that are charts with various information...All the books in the series have “fact bites” located throughout the books. These “fact bites” provide interesting facts about the animals in the book and are in bright yellow boxes to catch the reader’s eye. This nonfiction series will appeal to children with the wonderful photography and eye-catching format." I am an Australian children's writer trained in Zoology. I was also a zookeeper for 10 years. My earliest professional writing consisted of scientific articles. Then I branched out to the occasional magazine article about pets and travel. Now I focus solely on children's fiction and non fiction. My work includes picture books and information books, poems and short stories. I am internationally publ I am an Australian children's writer trained in Zoology. I was also a zookeeper for 10 years. My earliest professional writing consisted of scientific articles. Then I branched out to the occasional magazine article about pets and travel. Now I focus solely on children's fiction and non fiction. My work includes picture books and information books, poems and short stories. I am internationally published in Trade and Education markets. Two of my books are in award-winning series. I naturally gravitate towards writing about animals and nature-related topics. My home is in Melbourne, Australia, where I live with my husband and daughter.